Protech Godfather Damascus Special Grey anodized aluminum handle, Carbon fiber inlays, matching push button, Nichols stainless Damascus blade, custom Titanium pocket clip. Protech Godfather automatic knife for sale. Protech knives designed the Godfather with a modernized Italian stiletto flair,.....long, thin and sharp as a razor. The Protech Godfather has become a favorite among automatic knife users and collectors. 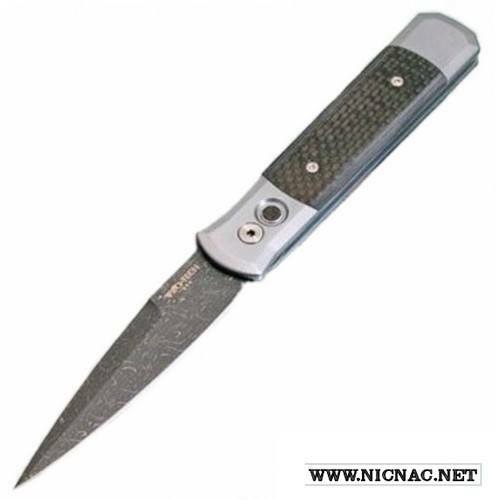 The Godfather has become one of Protechs best selling knives. Protech is known for their fine quality, attention to detail, great customer service and AMAZING SNAP!!! The Godfather knife will not disapoint.Specs: Overall Length: 9.3", Blade Length: 4", Blade Thickness: .125", Blade Steel: 154-CM, 59RC, Closed Length: 5.3", Handle Thickness: .485", Weight: 4 oz.